Introducing a series of stories about Miami's new microbiology physiology research cluster. Left to right: Xin Wang, Annette Bollmann, Rachael Morgan-Kiss and D.J. Ferguson (photos by Jeff Sabo). Four Miami University microbiologists — who make up the department's new microbiology physiology research cluster — collaborate on projects with each other and with more than a dozen researchers from other universities. Together, they are working on five projects funded by more than $5.2 million in recent grants from three national agencies. Study sites range from nearby Acton Lake to Antarctica. Microbes — the first living creatures on Earth — are microscopic, single-celled organisms found almost everywhere on Earth including on and inside you. Microbes make up more than 60 percent of Earth’s biomass. An estimated 2-3 billion species of microbes share our planet — but fewer than 0.5 percent (that's still 10 million) have been identified. The group in Pearson Hall's newly renovated lobby/study area. Microbes generate at least half of the oxygen we breathe. Microbial engineering for the production of biofuels. Manipulating microbial communities to function more efficiently for wastewater treatment. Studying extremophiles to create new engineering targets for artificial photosynthesis. Contributing to long-term research on climate variation in the South Pole. Four faculty mentor nine graduate and 11 undergraduate students on these projects. They collaborate with 13 researchers from 11 universities. One internationally-known artist, Xavier Cortada, is working with students and researchers. Click on the links to read their stories in Miami's Campus News. Rachael Morgan-Kiss and Xin Wang: "Antarctic algae, alternative photosynthesis and art." D.J. Ferguson and Xin Wang: "Microbes, QAs, methane: Top to bottom." Annette Bollmann: "Microbial 'neighbors' improve ammonia removal in wastewater." Undergraduate researchers at the 2017 forum (photo by Scott Kissell). 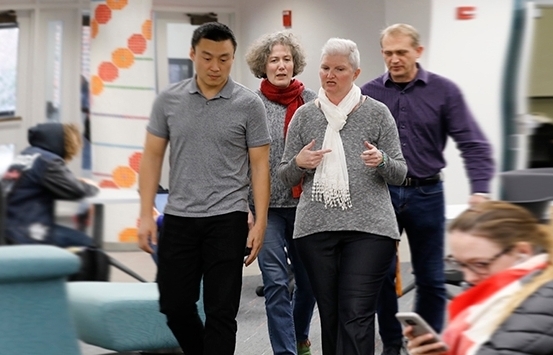 These faculty each mentor several undergraduate research students. 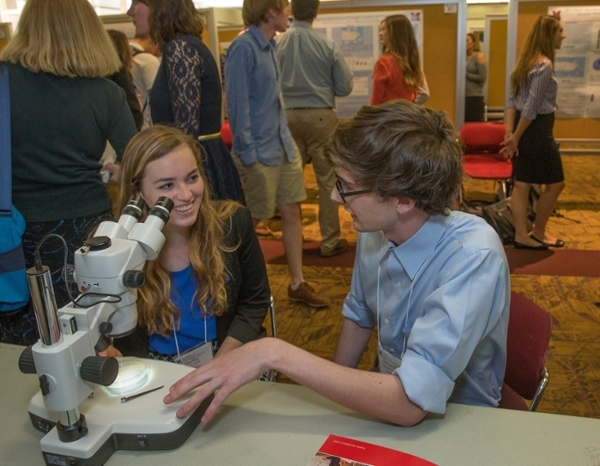 Learn more about their research at Miami's 25th Annual Undergraduate Research Forum, April 23-24. Morgan-Kiss: All students in her Microbial Ecology (MBI 475/575) class will present posters about their work with samples from Antarctica. Xavier Cortada, an internationally-known environmental artist based in Miami, Florida, will meet with the class to help them design posters for a broad, general audience. Ferguson's lab group: Sarah Soppe, senior microbiology major and Spanish double major, and Claire Papamarcos, senior microbiology major and environmental science co-major. Bollmann's lab group: Conor Dolson, senior microbiology major and premedical studies co-major. Wang's lab group: Kaya Mernitz, senior microbiology major and premedical studies co-major.